Collect your recycling items with the Pyramid 28 in. square receptacle with paper recycling lid. 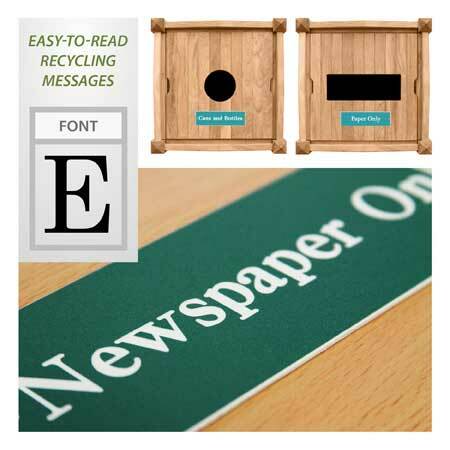 Great for recycling programs, the storage recycling receptacle accepts paper and cardboard. Engraving included. The solid teak Pyramid 28 inch square receptacle with paper recycling lid provides an elegant solution to the practical issue of recycling collection. The Pyramid series features pyramid-shaped finials on the corner posts. Side panels and lid are fabricated with tongue-and-groove construction. Lid features 13.5 x 4 in. hole to accept paper and cardboard. Perfect for recycling programs, recycling receptacles include a custom-engraved plastic plaque. Maximum of 24 characters per line and 3 lines of text. Allow an additional 2 weeks for delivery.